Posted by Spiros Panagiotou on Tue, 11/25/2008 - 21:13.
hi..i am from greece and i want to buy a wem cambinet 4x12 300 watts with fane cresento speakers.....i would like to know the price....could you help me ??thanks.. Posted by Joe Cav on Thu, 01/11/2007 - 00:36.
can anybody tell me which multifx he uses on stage? Posted by pr on Wed, 11/29/2006 - 21:31. Re: can anybody tell me which multifx he uses on stage? Posted by Stefan Flemming on Tue, 08/21/2007 - 10:37.
first, Dave Gilmour uses an old plexi Marshall with 4x12 1960 Marshallbox, The Guv´nor as Booster and some Compressions for Solosounds, and an old Hiwatt 100 Signature with WEM 4x15 Box for clean sounds. The special sound on comfortably numb is a light distortion sound from marshall with compressor. frequency justiring, maybe with an eq., on 500 Hz, 1000 Hz and 250 Hz for the Boddy. Please reduce the trebble so, that you mean, it´s a little to much. On Stratocaster switch on the middle on the last pickup and I´m shure you will be lucky. Posted by Shannon on Sat, 08/16/2008 - 12:11.
: first, Dave Gilmour uses an old plexi Marshall with 4x12 1960 Marshallbox, The Guv´nor as Booster and some Compressions for Solosounds, and an old Hiwatt 100 Signature with WEM 4x15 Box for clean sounds. : The special sound on comfortably numb is a light distortion sound from marshall with compressor. frequency justiring, maybe with an eq., on 500 Hz, 1000 Hz and 250 Hz for the Boddy. Please reduce the trebble so, that you mean, it´s a little to much. On Stratocaster switch on the middle on the last pickup and I´m shure you will be lucky. I'm not doubting that the above person managed to get a decent Gilmour sound with the rig he listed but it is absolutely not a David Gilmour rig. Gilmour uses (live) Hiwatts as amplifiers and a combination of WEM cabinets loaded with Fane Crescendo speakers and a Marshall cabinets loaded with Celestion speakers. The Hiwatts are used very clean....something that these amplifiers do exceptionally well! For effects: over the years it has changed dramatically at times. A strat is his guitar of choice and the distortion is created by use of a Big Muff Pi or Fuzz Face almost exclusively. Overdrive tones have been created using either a Butler Tube Driver, Colorsound Power Boost or sometimes in the past via an Ibanez TubeScreamer (though this effect is not a stable of the rig). Additional colour of the sound is created using various effects including (but certainly not limited to): Uni-Vibe, Phase 90, Dynacomp, EH Electric Mistress and delays and a handfull of others. Oh and there is always a mix of the above cabinets along with a special custom made "Dopola" speaker which is simply a rotating speaker. Posted by dougie on Fri, 02/09/2007 - 20:18. Posted by Pete on Tue, 08/14/2007 - 19:48. He doesnt use a multi effects proccessor, he uses a custom made Pete Cornish Pedal board, (search pete cornish there are detaisl of what its made form on his site) and the rack a variety of rack mounted effects and other goodies. everything to my knowledge is analog and tube driven. Posted by pr on Wed, 11/29/2006 - 21:29. Posted by karl on Sun, 11/19/2006 - 04:43. Guitar on "Near the End"I love the tone of the acoustic which is double delayed. I can still remember seeing Gilmour play during the About Face tour and using what appeared to be a black thinline acoustic-electric. Posted by Wes on Fri, 10/13/2006 - 23:25. Posted by jess on Fri, 11/10/2006 - 01:47.
so my question is ...... in the song time, what different petals does gilmore use in this song. Ive read he jsut put his fuzz into his clean channel for the solo. Posted by Mark on Wed, 01/17/2007 - 13:15. I tend to prefer the live solo from Pulse (the CD one is better than the DVD). This is easily achieved by big muff, delay and a touch of Phase 90 (script) at around 11 o'clock. The phase 90 helps get that fizzing type sound you hear. Posted by Matt Hecker on Thu, 11/02/2006 - 04:54. You dont wanna hear this, but the tape effects are all done by doing exactly what it sounds like: playing it slow, speeding it up and dubbing onto another recording. Posted by Kazass on Sun, 08/27/2006 - 13:05. What's the guitar Gilmour used on Live 8? Posted by Peter on Sun, 09/03/2006 - 19:07.
: What's the guitar Gilmour used on Live 8? Posted by Steve on Sat, 07/22/2006 - 02:32. I am looking to get about 4-5 pedals, and really like the sound gilmour gets on the pulse DVD. Any reccomendations for the key pedals to get? Posted by David on Wed, 10/11/2006 - 21:48. Try getting a PodXT from Line 6 (www.line6.com). It models more effects than you'll want to buy pedals for. There's also an extensive online community with different guitar tones and you should be able to get sounds very close to Gilmour's. : I am looking to get about 4-5 pedals, and really like the sound gilmour gets on the pulse DVD. Any reccomendations for the key pedals to get? Posted by brian myers on Fri, 02/09/2007 - 12:55. Posted by Peter on Sun, 09/03/2006 - 19:21. With 4 or 5 pedals???? you'll be lucky, lol, i think Mr Gilmours pedal boaard comprises of about 12 different pedals not including volume, and whammy pedals, and then theres the whole issue of amps and THE RACK, which add different things, and the fact he has EMG active pickups which cost a tidy sum, However if you want too start getting a few bits together i would suggest a volume (if you dont have one) a distortion pedal try the boss ds-1, a chorus, a muff and a rotating speaker simulator (okay so he uses the real thing, but if you can even find a leslie in good condition let alone at a reasonable price i'd be amazed)he also uses a Whammy pedal here and there (digitech make a very nice one)and a rat and reverbs are used extensively, my suggestion would be too go and try a few different pedals see how they work, how they sound and how you like them. Posted by steve (Blink Floyd) on Tue, 08/01/2006 - 23:37. Posted by billison on Sun, 04/23/2006 - 13:21. What kind of guitar does David Gilmour use when playing Wish You Were Here? Acoustic or Electric? Ibanez, Strat, ect.? Re: what kind of guitar? Posted by shawn on Wed, 07/19/2006 - 21:34.
he plays a black fender strat with a chopped trem bar-for easy hand use- dimarzio bridge pick-up abd middle and neck prck-ups 1960 stock pick-ups. the guitar is a 1971 strat with a black pickguard. Posted by Eddy on Thu, 05/11/2006 - 19:25. I think he uses a jumbo slide guitar not completely sure though. Posted by Si Martin on Wed, 05/31/2006 - 20:38. There are actually 2 guitars playing with the the lead / fill played by by Gilmour. I have seen a twelve string play the strum part before but the last time I saw him play I think there were two 6's. If you want to play this solo try using some chorus and play the fills between beats - sounds really nice. Would recomend a digital recorder for such tunes, you can record the basic strum then sing and play the fill over it - again, most enjoyable ! Posted by Peter Baldwin on Sat, 06/24/2006 - 12:49.
: There are actually 2 guitars playing with the the lead / fill played by by Gilmour. I have seen a twelve string play the strum part before but the last time I saw him play I think there were two 6's. If you want to play this solo try using some chorus and play the fills between beats - sounds really nice. Would recomend a digital recorder for such tunes, you can record the basic strum then sing and play the fill over it - again, most enjoyable ! which pedal for the 1st comfort numb solo?? Posted by karl on Wed, 04/12/2006 - 15:35. Re: which pedal for the 1st comfort numb solo?? Posted by tobias on Tue, 05/02/2006 - 19:38. Posted by Hadriel on Tue, 02/26/2008 - 18:07. Posted by Hadriel on Tue, 02/26/2008 - 18:09. Posted by David Waters on Wed, 02/28/2007 - 13:05.
: Actually the correct answer is, Big Muff, electric Mistress "Flanger" and Neck and Bridge pickup at the same time, "Gotta add a switch to your guitar. Posted by Peter on Sun, 09/03/2006 - 19:30. Posted by karl on Sun, 04/02/2006 - 18:31.
whats the best delay for the gilmour sound? Posted by karl on Sun, 04/02/2006 - 18:24.
hi iv got a holy grail reverb pedal by electro harmmonix which you can put flanger on it is that ok to use or do i need the electric mistress? Posted by karl on Sun, 04/02/2006 - 18:20. Posted by karl on Fri, 03/31/2006 - 16:55.
which big muff shall i get usa or russian? and iv seen one called sovtec big muff is that russian vintage one? iv hered he used a vintage one but do i need a vintage one what shall i get? Posted by rich on Mon, 10/09/2006 - 16:01.
: which big muff shall i get usa or russian? and iv seen one called sovtec big muff is that russian vintage one? : iv hered he used a vintage one but do i need a vintage one what shall i get? : i have the "big green box" big muff pedal. it has the russian writing on it. splendid pedal if i say so. i bought it back in 1997 and it sounds great. yes theyre hard to find but if you do you will be glad you made the purchase. Posted by Peter on Sun, 09/03/2006 - 19:26. Posted by Brian on Fri, 03/31/2006 - 19:00. The Sovtec's were the original Russian Models. They are the old GREEN one's and they are the best, but they are normally expensive and hard to find. They are currently still making 2 models...One is the CHROME one that is the made in USA one and I've heard they are pretty much junk. The BLACK Russian model is the other one currently made and I've heard those are better than the USA models. I personally haven't used either one so I can't say for sure. Up until 1977 Gilmour used a Dallas Arbiter Fuzz Face. I've heard the reissues of those are sketchy as well. I actually use an old Boss FZ-3. Boss made 2 Fuzzes back in the 90's but they are both out of print now. I picked one up off ebay for $50 and it works good for me. If you can I'd recommend ordering one from a place that will give you 30 days to try it out. Order like the Russian Model and a Fuzz face or something and see which one works better for you, because depending on your guitar and amp setup both will sound totally different. Dunlop is also making a modified Fuzz Face called the Jimi Hendrix Classic fuzz...looks like an MXR DynaComp but it's RED in color and Says Classic Fuzz. That one I have tried and I think it works really good. To each his own though. If at all possible...try out a few different ones and see what sounds best with your equipment. Posted by karl on Sun, 04/02/2006 - 17:10. 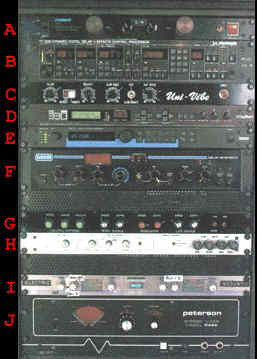 Posted by karl on Mon, 03/27/2006 - 20:38.
when and where does gilmour use the compressor and which one? solos only. my guess is shine on and brick in wall but where else?? Posted by Brian on Wed, 03/29/2006 - 16:43. He uses them all over. Sometimes just for solo's but many times for rhythms too. You have to understand that the reason he uses a compressor is because generally when you're playing your bass notes on your heavier strings stick out and are Louder when you're playing, then your high notes and light strings are. David wanted to even that out. It's just a matter of taste. Sometimes he ran 2 or 3 compressors at the same time. He did that on Run Like Hell. It's just a matter of playing around with it and seeing what you like. You also have to remember that in the studio they use compression on the recordings and can do all sorts of studio tricks. And even on like the PULSE live album there is extra compression from the PA and recording equipment and such. Your best bet is to find old bootlegs. David sounds like David but it's different in a truly LIVE setting. He also plays extremely loud through a TUBE amp, which changes your tone a lot as well. Play through a little amp with a Big Muff...then through a large amp cranked with a Big Muff and you'll get a totally different sound. : when and where does gilmour use the compressor and which one? solos only. : my guess is shine on and brick in wall but where else?? Posted by karl on Fri, 03/31/2006 - 15:52.
when and where ? ?rat or muff?? Posted by karl on Mon, 03/27/2006 - 20:35.
when and where does gilmour use the rat and the big muff my guess is rat for time, big muff for second solo of comfortably numb im i right??. Re: when and where ? ?rat or muff?? Posted by Brian on Wed, 03/29/2006 - 16:28. I don't know so much about the Rat but the Big Muff he uses all the time for solo's. The end solo of Comfortably Numb is just 1 example. Pretty much any solo from Animals or the Wall or Final Cut or Momentary Lapse or Division Bell he is using the Big Muff on. Only dirty solo's though. Like the first solo for Comfortably Numb is just either an Overdrive or Clean Boosted signal. He didn't get the Rat pedal until the late 80's if I remember correctly and he only uses it to get 1 kind of sound for the Time solo or Money or something like that. 99% of the time for solos it was a Big Muff or a Pete Cornish moddified version. : when and where does gilmour use the rat and the big muff my guess is rat for time, big muff for second solo of comfortably numb im i right??. Posted by karl on Fri, 03/31/2006 - 16:10.
thanks mate which muff shall i get iv hered the both bad do you need vintage. also what pedal would do for the first solo of comfortably numb? someone mentioned a boss blues driver would that do it?? Posted by karl on Mon, 03/27/2006 - 19:49.
is it possible to get the gilmour tone without vintage or even the same gear. i want to get the mxr dynacomp after what iv hered but will i still get the sound with a new one. Posted by Brian on Wed, 03/29/2006 - 16:34. You don't need a vintage compressor for a similar tone. A new one will work just fine. : is it possible to get the gilmour tone without vintage or even the same gear. i want to get the mxr dynacomp after what iv hered but will i still get the sound with a new one. Posted by karl on Mon, 03/27/2006 - 19:44.
could anyone one tell whats the next best thing to the chandler tube driver as i live in the uk and there are only usa ones out there. also is that what hes using on shine on with gain turned down? Posted by Brian on Wed, 03/29/2006 - 16:33. On the original recording of Shine On You Crazy Diamond from wish you were here he used an old powerboost pedal to overdrive the signal. Only in the 90's did he start using the Chandler Tube Driver. Any good overdrive pedal will work fine in general for those slightly overdriven solos. A BOSS BD-2 Blues Driver is a good one (in my opinion of course). But pretty much any good name brand overdrive/booster pedal will work. : could anyone one tell whats the next best thing to the chandler tube driver as i live in the uk and there are only usa ones out there. also is that what hes using on shine on with gain turned down? Posted by karl on Fri, 03/31/2006 - 16:15.
many thanks brian i cant believe i was going mad for the chandler tube driver as im only into early 70s to early 80s.